NASA's Driven to Explore will visit the Kansas Cosmosphere & Space Center in Hutchinson, Kan., on Wednesday, September 15, 9 a.m. to 7 p.m., Thursday, September 16, 9 a.m. to 7 p.m., and September 17, 9 a.m. to 7 p.m. Come out with the whole family to enjoy this extraordinary exhibit! NASA’s Driven to Explore (DTE) mobile, multi-media exhibit immerses visitors in the story of NASA. Guests will learn about the significance of human space exploration and how NASA provides critical technological advances to improve life on Earth. The walking tour includes imagery and audio and visual technology to connect visitors with the space program, highlighting advanced human research that will ensure safe and sustainable future missions, and next-generation vehicles and surface systems destined for use exploring beyond low earth orbit. The centerpiece of the DTE is a nearly 4-billion-year-old piece of moon rock brought to Earth by the astronauts of Apollo 17 in 1972, America's last human mission to the moon. The rock is one of only eight lunar samples made available for the public to touch. For more information about NASA exploration, visit http://www.nasa.gov/exploration. This has been a hot and hopping summer, inside and out, at the Kansas Cosmosphere and Space Center! Free Family Fun Day celebrating the 50th Anniversary of the Liberty Bell 7 and the historical last NASA shuttle landing of Atlantis on Thursday, July 21. We got an extraordinarily early start and kicked the day off at 4 am with coffee and donuts to watch the landing of Atlantis at 4:56 am, exactly as NASA had projected! With 60 people in attendance we sat misty-eyed, yet joyful, as Atlantis took a farewell circle around Kennedy Space Center and landed safely for the last time. After the landing party the Hall of Space Museum remained open, admission free, until 9 am when we started Coffee at the Cosmo! 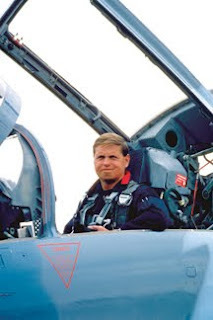 Chris Orwoll, President and CEO, gave an informative talk about the logistics of Liberty Bell 7’s flight, rescue efforts, and eventual retrieval from the bottom of the ocean floor. “Because of its importance to the space program’s history and our own, Liberty Bell 7 is a gem in our museum collection,” said Meredith Miller, Curatorial Collections Manager. 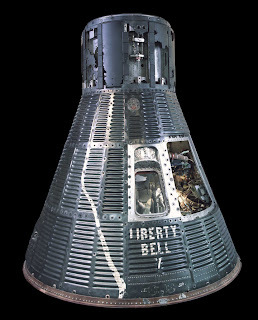 A gem it is indeed, the Cosmosphere made the search and retrieval efforts their mission, and Liberty Bell 7 became the only flown American spacecraft not owned by NASA or the National Air and Space Museum (NASM). As part of Orwoll’s lecture he displayed artifacts from the Liberty Bell 7 that the public was invited to see up close. The action packed day didn’t stop there! Morning and afternoon Liberty Bell 7 Restoration Q&A programs were conducted by Space Works, the group who restored the Liberty Bell 7 after its dramatic retrieval from the ocean floor! Dale Capps, Jack Graber, and Jim Franko, Space Works crew, as well as Meredith Miller and Amanda Bailey, Registrar, spoke in detail about their processes during the six months it took to clean the spacecraft after 38 years on the ocean floor. As the film footage of the Liberty Bell 7’s rescue ran on the big screen, visitors enjoyed many different activities in the lobby. Children who visited that day were invited to craft their very own mission control patches while “The Right Stuff,” simulated astronaut physicals, was conducted in the KAOS camp area on the second floor. It was an even more exciting day than usual at the Cosmosphere, one we will never forget!